He was a mere boy when he heard them. But the stranger’s words would prove prophetic and impactful in shaping John Stewart’s professional future. John’s understanding of the public’s deep respect for a talented physician crystallized in that moment. By itself, the brief conversation would not determine the course of his life, yet his fresh memory today of that otherwise-trivial comment proves how strongly it continues to resonate decades later. Bloodlines weighed equally in promoting a medical choice. Both of John’s parents were doctors, as was his grandfather and an astounding assortment of aunts, uncles, and cousins. “I was surrounded by medical professionals,” he recalls with a warm smile. That combination, one might assume, set the table for the single-minded pursuit of a medical career. But the reality was much different. In fact, John’s path was punctuated more by ambivalence than devotion. In a general sense, entry into medical school clarified John’s future course. One important question remained: what branch of medicine would he follow? Arguably, graduating as a specialist might be more prestigious, and John found encouragement among his professors to enter obstetrics and internal medicine. But after exposure to many potential areas of specialization, John opted for a different direction. Graduation saw John begin two years in Kitchener emergency rooms. Usually, a doctor will divide time between a practice and ER duty, but John’s work was done entirely in the emergency room. He looks back on the experience philosophically. Fate came calling. At a family gathering, a chance conversation revealed that Port Perry’s newly-formed Medical Associates was seeking to add to its three-person staff. John fit the clinic’s basic requirement, an interest and capability in all areas of medicine. And its location fit him. Each doctor on Medical Associates’ roster needed broad knowledge, such that all would be interchangeable. And each had to offer something unique. In John’s case, his interest in long-term care would provide that the clinic with that additional skill. So began a lifetime association, both with Medical Associates and with the community’s nursing home. Time passed and as Medical Associates prospered, John’s practice grew. The experienced doctor received an invitation to sit on a provincial review panel. The opportunity would, in his words, change his life. “In the early 90s, the Ontario government planned to publish guidelines for the appropriate use of antibiotics,” he recalls. “I learned that the Ministry’s long-term plan would link pharmacies to a central database, and require a physician’s diagnosis for each prescription. Where the diagnosis didn’t match their guidelines, OHIP would reject the patient’s claim. John spearheaded a three-pronged initiative to do just that, using Port Perry for his study area. Across-the-board education would prove the key to its success. Doctors, pharmacists, and patients would receive a consistent message, delivered in a concentrated timeframe. Studying 10,000 patient visits and comparing to the prior year, the project showed impressive results. Overall prescriptions declined by 10%, while there was a 29% shift to less potent “first-line” antibiotics. The group successfully replicated its impressive results in nine GTA communities, but couldn’t sustain funding. Ironically, the project drew worldwide accolades. The experience sharpened John’s interest in the academic side of medical practice. 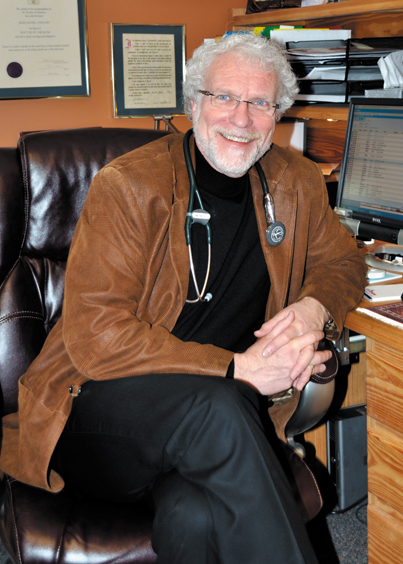 He incorporated its lessons into teaching medical residents at Port Perry Hospital. With an associate, he is currently developing a two-level website tailored to very different audiences with an equal stake in learning. The ever-increasing speed of information flow is only one change John has seen over his years of practice. Operating a busy practice and sporting a lengthy resume of advisory board memberships, John finds release from the stresses of a full professional life with a variety of exercise. Today, at 62 years of age, he cycles and regularly meets the challenge of a backyard wave pool. And for more than 35 years, he’s kept a standing squash date at least two mornings a week with longtime friend and local dentist, Jack Cottrell. But his hidden passion lies in theatre. John’s trod the boards, and worked backstage, with the local Borelians and Choral Society, earning multiple award nominations from the Ontario Association of Community Theatres. John and his wife Barb have two grown sons. Older son Kevin teaches science at a Toronto private school, while Todd, two years younger, flies for Air Canada. John chuckles at the observation that the Stewart family’s medical “dynasty” will end with his generation. As is John. From the teenager who initially disdained a medical career, he now has no doubt about the wisdom of that choice. “I have no regrets. It’s been an amazing opportunity, to make a difference in people’s lives.” Just like his father did. But years previous, an anonymous hospital patient had sagely predicted that outcome, and unwittingly offered the inspiration for a talented young man to follow his ideal calling.